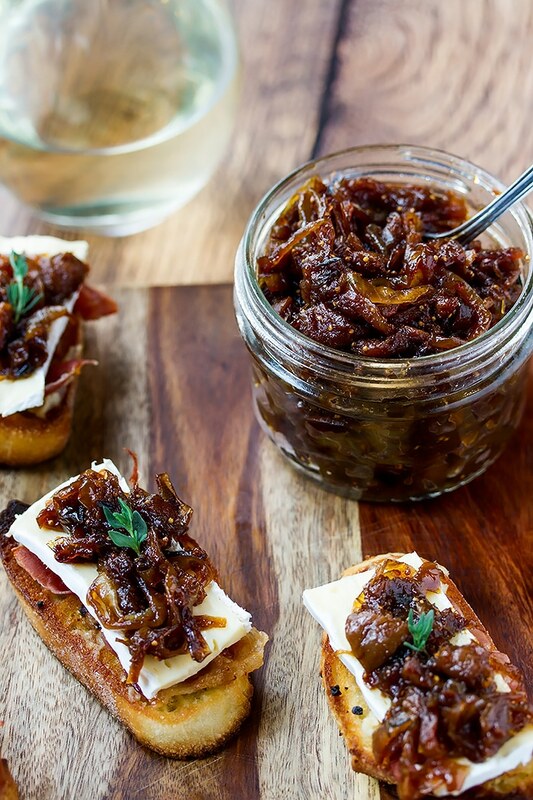 Sweet and savory onion and fig jam with creamy brie, crispy prosciutto and roasted garlic on top of buttery toasted crostinis makes an impressive appetizer that’s just as easy to make for 20 as it is for 50. These crostinis look seriously impressive. Like they were made by a proper chef. Only they weren’t. We made them. And YOU can make them. Easily. And totally impress the heck out of your guests! They are O.M.G. delicious! 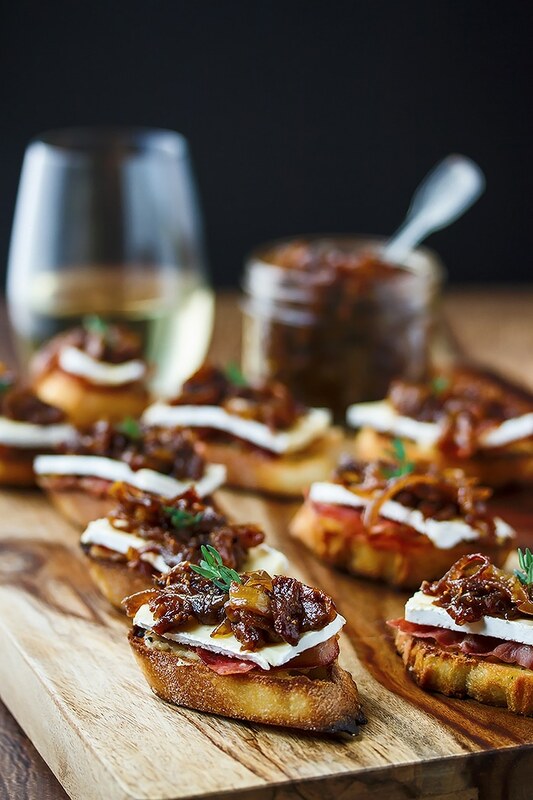 Roasted garlic is spread on the bottom of a buttery crostini topped with a crispy piece of salty prosciutto paired with the creamy brie and the sweet and tangy onion and fig jam made with wine and thyme. The great thing about these little appies, taste and looks aside, is that they are very scale-able. It’s just as easy to make 50 or even 100 of these as it is to make 20. It just takes a tiny bit more time to assemble. They are a great option for a more upscale dinner party because they look fantastic, but you can prepare EVERYTHING before hand and then just assemble 15 mins before you want to serve them. The only thing we would recommend doing right before you serve them is cutting the cheese slices (throw your brie in the freezer for 10 mins before you cut it to make the slicing even easier). When we make these, we like to double the amount of crostinis, garlic, prosciutto and have an extra round of brie in the fridge just in case you need to make more in a hurry. It hardly takes any more effort to roast extra garlic, crisp up a few extra slices of prosciutto, and toasts another baguette. Everything keeps well in the fridge and the crostinis keep well for a few days if you store them in an airtight container or ziplock bag. It would make a wonderful gift! 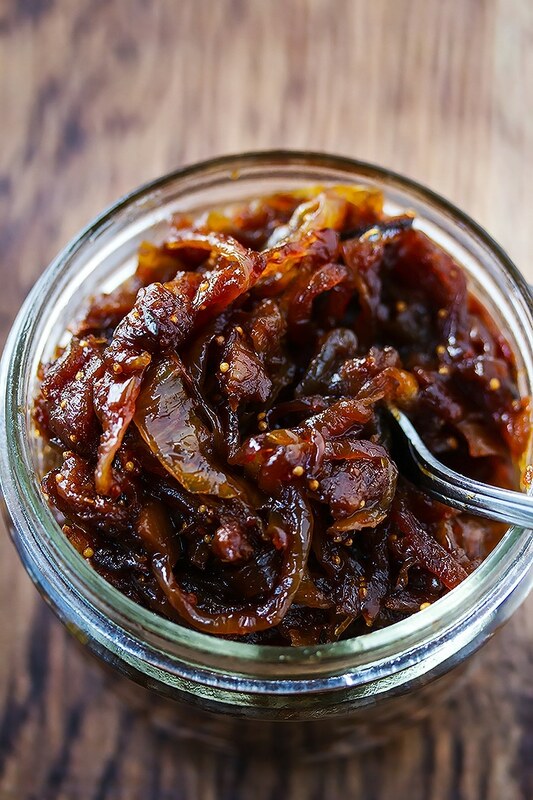 You could fill little jars of this onion and fig jam and give it away over the holidays. How awesome would you be if you made extra jam, filled a few jars, made this appy for a dinner party and then sent your guests home with a small jar of their own! Kevin and I are planning a Christmas party in December to celebrate the season as well as our move into our new shop where we will live while Kevin builds our house. We’re inviting all our family and friends and this appetizer is firmly on the menu! Are you planning any holiday parties this season? Add all the sliced onions, figs, butter, olive oil, and thyme sprigs to a large pan. Heat to medium-low and cook, stirring every few mins, until the onions caramelize and the figs break down. This will take 15 - 20 mins or so. Then add the second bit of butter, balsamic reduction, and wine. Stir well. Cook for another 5 - 10 mins until the mixture breaks down even more and gets nice and jammy. Remove from heat and cool. Set aside or store in the fridge until you are ready to use it. While the onion and fig jam is cooking and you''re making your crostinis, roast the garlic. Turn the oven on to 400 F. Cut the top off of each of the heads of garlic and place each one on a square of tin foil. Drizzle with olive oil and sprinkle with salt. Wrap each one up in the foil and place in the oven on a rack. Roast for 30 - 35 mins until they feel soft. Pull them out and let them cool. Crisp up your prosciutto. Heat a large skillet to medium heat. Place the strips of prosciutto in and cook for a min or two on each side. They will crisp up quick and you don't want them so crispy that they will crumble. Remove from the heat and cut into crositini size pieces. Set aside. First cut up the brie in long skinny strips. Then into 2 inch pieces or so. Take a crostini and a clove of roasted garlic and smear the garlic on the crostini. Next put on a piece of crispy prosciutto, followed by a slice of brie and top all of that with a generous tablespoon of the onion and fig jam. Garnish with a sprig of thyme. 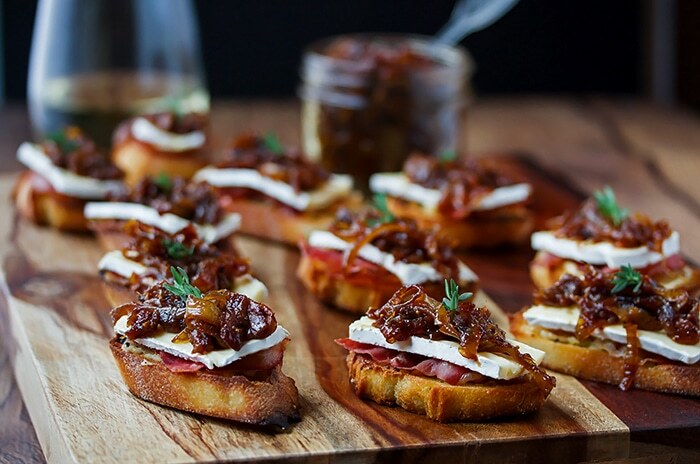 We like to double the amount of crostinis, garlic, prosciutto and have an extra round of brie in the fridge just in case you need to make more in a hurry. This jam recipe makes more jam than you will need for 1 loaf of bread. You will have enough jam to cover the crostinis you would get from 3 loaves of bread. I have a question about the Onion and Fig jam portion of his recipe. Does it call for just 6 figs or should it be 6 cups of chopped figs? My figs are small brown figs, so 6 would not add much fig flavor. Hi Sandy, just 6 figs is good. You chop them up and add them and they melt in. However, if you dont think thats enough, just add some more 🙂 This recipe doesn’t have to be exact. I wouldn’t add 6 cups though! The jam is AMAZING! I just made it for a wine tasting event. I can’t wait for my guest to try it. Thank you Brenda!! We love it too 🙂 So good with wine…! This recipe looks wonderful and I am considering making it for a party I am having for around 50 people. Maybe I missed it. You talk about how the recipe is as easy to make for 20 as it is for 50 or 100 but I don’t see where you give a yield for the recipe as written. About how many pieces does the recipe as written make? Does the onion and fig jam recipe make more than enough to cover one loaf of bread or is it just enough. Thank you. Hi Lisa, you are right. Sorry about that! Ive added some notes to the recipe. This jam recipe makes enough for about 3 skinny baguettes turned into crostinis. For 50 people I would probably make at least 2 baguettes, but that depends on the other food that you have for your guests as well. Hi there! I can’t wait to try this recipe! Do you use dry figs or fresh figs? Thank you! We used dried, but ones that were still moist. You could use either though. If we had fresh, we would have used them. Hi there! I am salivating just reading this! I recently started making Marmelade and I was wondering whether I could preserve this one, (sterilize the jars and store them in the cupboard). Do you reckon it would spoil? Thank you! I think you could. We haven’t tried it, but if you do it just like you would do any other kind of jam, it should work the same. I made this for s bday party last week and it was amazing. Everyone loved it. Thank you for a great recipe. Yay! We really love hearing this. Thanks for letting us know 🙂 We’re so glad you loved it. This sounds amazing. Making it for Xmas eve cocktail party but I would like to make the onion fig jam ahead of time. Do you know how long this will keep in the refrigerator? Good idea! That’s what we would do too 🙂 It will keep in the fridge for a couple weeks just fine. Let us know how they turn out! Hi, I just read the recipe and I so excited to do it, but I have 2 question. First, what other options I can use rather than prosciutto? (because I don’t eat pork) Second, I already made fig Jam, can I add from it rather than using 6 Figs or I have to use them? Hi 🙂 First of all, ya! 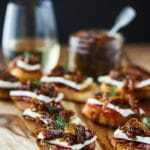 I would use the fig jam and just mix it with some caramelized onions, thyme, wine and balsamic. As for the prosciutto… you could try Bresaola which is a air dried curred beef. 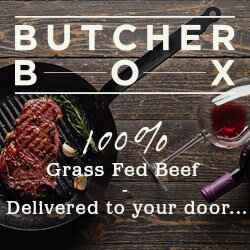 Or you could try some other smoked meat. Or just take it out all together, the crostinis with cheese and the jam will still taste great. Or maybe try turkey bacon…?? Let us know how they turn out! How many large sweet onions would 10 cups be?